No hidden charges and excellent customer support. Exchange your currency with CurrencyFair at the best available rates for just one small, fair, transparent fee. Winner of 2018 Best International Money Transfer in the Mozo Experts Choice Awards. 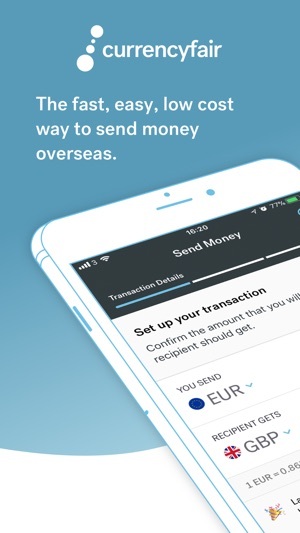 Whether you are moving abroad, sending money home, paying tuition fees or foreign invoices, the CurrencyFair app helps you send money at bank-beating exchange rates. Avoid the hidden and excessive fees charged by banks and brokers, and save on your international money transfers. 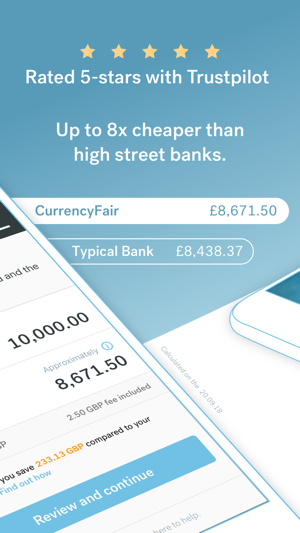 - A CurrencyFair account stores multiple currencies, ready for you to exchange. - World class customer support with a 5 star “Excellent” rating in Trustpilot. - Fully Regulated and Authorised. - Over €7 billion exchanged to date with over €200 million in savings for our customers. 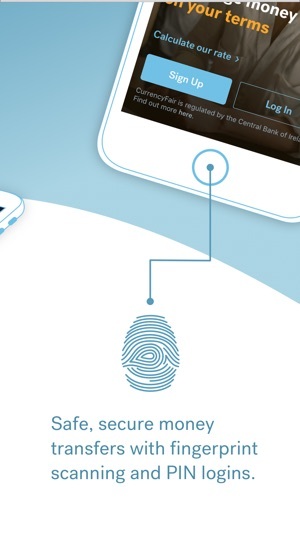 Download our free app to manage international money transfers without the hidden bank charges. Save on the hidden cost of buying property overseas. 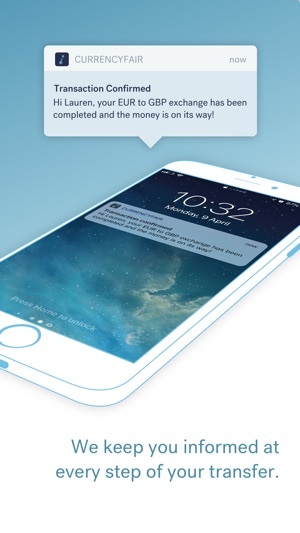 Send monthly mortgage payments in another currency. Transfer money to family members back home or abroad. Transfer your pension to a bank account overseas. Send money back home to save. Pay overseas suppliers and foreign invoices. Receive payments from international clients. There are no hidden markups, just great rates for anyone who is sending or receiving money from overseas. “ Great rates, brilliant customer service, really easy to use, have been using for 5 years, wouldn’t bother with any other company.” - Shirley Kitts. So start saving on your money transfers today and open a free account in just 3 simple steps. It doesn’t get much fairer than that. Emirati Dirham (AED),, Danish Krone (DKK), New Zealand Dollar (NZD), Australian Dollar (AUD)*, Euro (EUR), Polish Zloty (PLN), Canadian Dollar (CAD), British Pound (GBP), Swedish Krona (SEK), Swiss Franc (CHF), Hungarian Forint (HUF), US Dollar (USD), Czech Koruna (CZK), Norwegian Krone (NOK), South African Rand (ZAR). *It is not possible to send in Australian dollars to be exchanged from outside of Australia. Emirati Dirham (AED), Euro (EUR), New Zealand Dollar (NZD), Australian Dollar (AUD), British Pound (GBP), Polish Zloty (PLN), Canadian Dollar (CAD),Hong Kong Dollar (HKD), Swedish Krona (SEK), Swiss Franc (CHF), Hungarian Forint (HUF), Singapore Dollar (SGD), Czech Koruna (CZK), Israeli Shekel (ILS), Indian Rupee (INR), US Dollar (USD), Danish Krone (DKK), Norwegian Krone (NOK), South African Rand (ZAR). Now you can have a full French or German language experience with CurrencyFair - making your online money transfers even easier. When you log in to your account, simply go to the the Settings section of your CurrencyFair app. Select French or German to change your language. In addition, the emails you receive from CurrencyFair can be sent to you in either French or German. Or if you want to keep your emails in English you don't have to do a thing - just sit back, relax and enjoy your savings. This is the only app review I've ever written and possibly the only one I ever will write. I look forward to the day that many more currencies/countries can be joined into CurrencyFair. As a retired wanderer, I do all my significant forex here for currencies that it handles. When there's no rush, I use the marketplace feature to great advantage. On the very rare occasions I've had issues, including errors that were my own fault, customer support has been exemplary. 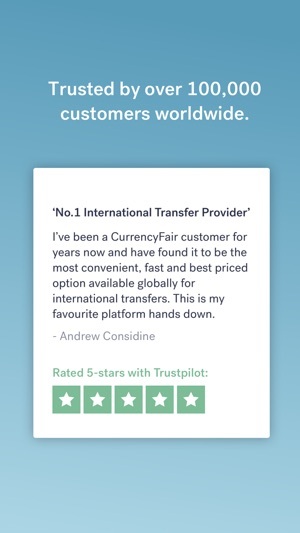 CurrencyFair lives up completely to its name: it does exactly what it says on the tin! I use CF regularly on desktop, and now I can do currency exchange on the go! Great for expats, frequent travellers, etc. The app is very easy to use and intuitive. Highly recommend.